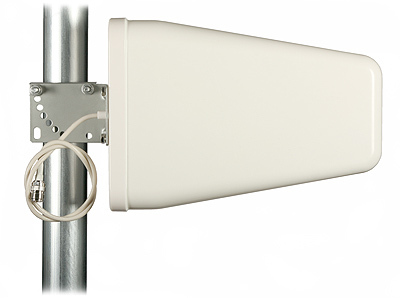 TRANS-DATA LTE KYZ 7.5/8/10 A741031 is an outdoor, directional log periodic antenna for use with LTE (4G), 3G, DCS, GSM modems and cellular phones, as well as with GSM ( A6765, A6775, A6785) and 3G ( A67105) repeaters . The antenna has 7.5 to 10 dBi gain (depending on the band). Mounting possible to vertical, horizontal, or angled (45o) tube. NOTICE: Drainage holes must be at the bottom! TRANS-DATA is a brand of high performance antennas for wireless reception and transmission of digital data. Thanks to high quality materials and superior workmanship, the antennas are characterized by reliable and stable parameters. TRANS-DATA antennas significantly improve signal strength and increase the coverage area.